In response to the editorial published on March 20 titled “Prioritizing Student Needs,” as well as the unfortunate cartoon connecting mental health crises and Presidents’ Ball funding, there are a number of one-sided points for which I would like to provide an alternate perspective. 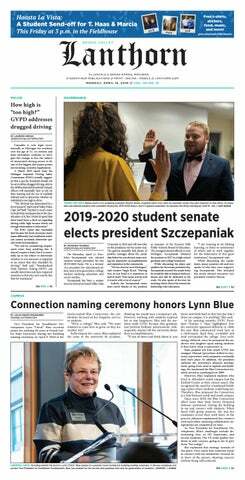 Contrary to the subheading of the editorial, “Student senate budget process needs more transparency,” I can personally attest to the fact that this year’s budget process was by far the most transparent since my time on the senate. First, it is important to note that the minutes of every appropriations meeting, during which the student life fund is allocated, are available online. Furthermore, the editorial mistakenly alleges that funds are “divvied up in closed committee meetings,” when in fact, the weekly appropriations meetings have always been and always will be open meetings. We invite you to join us and see first-hand the careful consideration behind every decision made. Second, there is an additional eight-page document that outlines very specifically the exact spending of the 2015-16 budget, along with rationale behind the changes in the 2016-17 budget. This year-end report is not required nor expected of the finance committee, but it is out of respect for the students we serve that the group chose to be as transparent as possible in this budget process that we take very seriously. To highlight some of rationale the editorial board asks for (which again, is available on OrgSync), I will start with Greek life. The reduction to Greek life funds was not to prevent Greeks from applying for funding, but to increase accountability for the way the money is spent. The Greek events that give back to the community or have a campus impact beyond their own chapters will absolutely still have access to as much funding as they did before. The only difference is that they will instead submit a request categorized as service and advocacy (or the appropriate council), and be held to the same standard of appropriations that apply to all other groups. It should also be noted that multiple members of the Greek community on student senate voiced their strong support for this reallocation of funds during discussion. Another area that seems to be of concern to the editorial board is the increase in service and advocacy as well as Presidents’ Ball. The rationale for both is simple: the incredibly high demand and impact on students. Service and advocacy events, initiatives and groups are what draw many students to GVSU in the first place, and are what help GVSU feel like home to many. Additionally, the appropriations board had to turn down thousands of dollars of potentially high quality, meaningful requests this year, simply because there was not enough funding. Presidents’ Ball is also a beloved tradition that grows every year and now impacts some 5,000 Lakers. Growing events require a growth in funding, and the budget increase is reflective of the need that has not been met for the past few years. Finally, I ask the Lanthorn to consider the harm of making light of mental health crises in a cartoon that insinuates a connection to Presidents’ Ball funding. We do not personally fund the Counseling Center nor any of the other wonderful resources available on campus to provide support for students. Let us please also remember only a few issues of the Lanthorn ago, when the front page was a story on the entire week student senate spent hundreds of hours planning, solely dedicated to mental health awareness. It is always our goal to be transparent, but in order for that transparency to be communicated to the student body, they deserve to hear the whole story.